There is nothing like waterfront dining at every opportunity - and we make the most of it! Some of our loveliest breakfasts, favourite lunches and most romantic dinners have been on (and by) the water. We have enjoyed waterfront dining in Australia from the Kimberly Coast in Western Australia to the West Coast of Tasmania. When cruising on the Coral Princess we have even dined on a sandy cay off the coast that disappears with the tide! Meals are often more relaxed when by the water, with shoes often an option and hats sometimes a must. If a sunset occurs before or during the meal it is always a bonus. It is lovely to look across the water at the setting sun - whether it is setting across Westernport Bay, The Indian Ocean or The Baltic Sea. And the restaurant - over the water, with tanks of fresh-caught fish to choose from! Seafood is regularly on the menu; sometimes caught that day just before the meal. 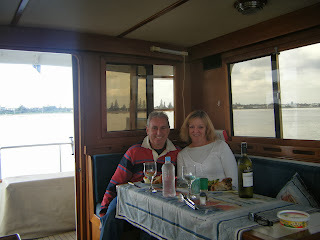 We have enjoyed Barramundi in Darwin, Sea Bass in Spain and fresh oysters and prawns in Port Douglas. We are not really what you would call fishermen, but we appreciate the efforts of others in bringing our meal to us! We have the rods....but don't count on us for the fish! Of course, the waterfront doesn't have to be the ocean - a riverfront is just as special, as is a lake....even a dam will do!! From a steak sandwich on the banks of the Wyangala Dam (Cowra, NSW) to prawn rolls on the Myall Lakes (Port Stephens), roast lamb when camping along the Darling River, spaghetti bolognese camping on the Cooper Creek, kangaroo cruising on the Franklin River and snails while cruising on the Soane River in Lyon, France - every culinary experience has been wonderful. Meals are always special on the water!